Private-industry cooperation with government is vital to finding and tracking terrorists. If telecoms are punished for their good-faith reliance on executive-branch representations, they will not help the government except when clearly compelled to do so by law. Only full immunity, including retroactive immunity, will guarantee full cooperation. I think the bigger danger here is providing a precedent that firms can break the law when asked by the administration, then bailed out afterwards. Only fear of prosecution is likely to make firms obey the law in the first place. Providing immunity would invalidate the concept of the rule of law, and open the door to more illegal actions carried out by the executive branch. “Full cooperation” is precisely what we do not want to encourage. If government wants to intercept the communication of private individuals, it must be a policy adopted through the due course of law. People need to know what it involves (though not necessarily the details of exactly how it works), who supported it, and how those supporters justified the choice. Greater security from terrorism at the cost of a more opaque and lawless state is not a good tradeoff. Company bosses should fear that they will be the ones in the dock when evidence emerges of their engaging in criminal acts, regardless of who asked them to do so. The alternative is more dangerous than the plots that warrantless wiretapping sought to foil. Is that a bill-board reflected in a puddle? 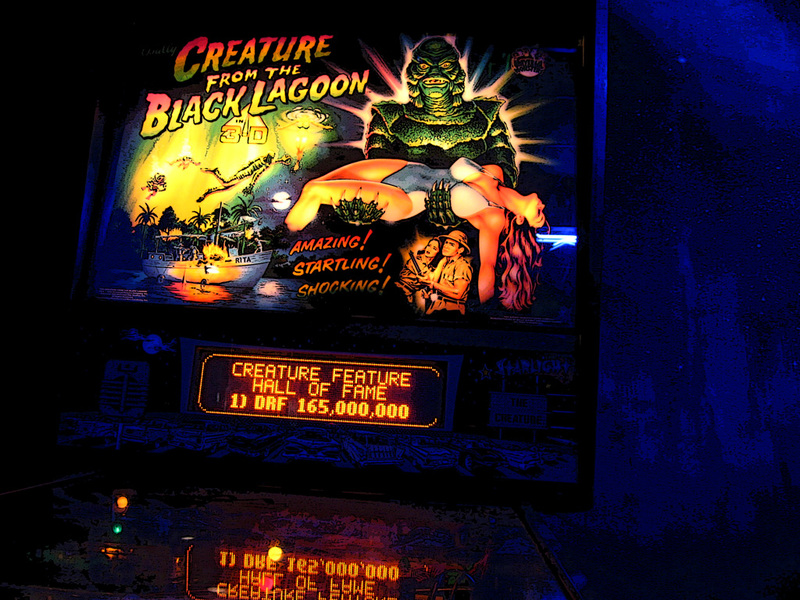 The photo is of a pinball machine in the bar (Zaphod’s) where Meaghan and I saw that concert. We must give the telcos immunity because if we don’t, they might be reluctant to break the law in the future. That man definitely has a way of expressing things with unusual humour and clarity. It’s a great shame Comedy Central has sabotaged their website for Canadian viewers. It is now so awkward to get clips to load on a computer in Canada that I hardly ever bother. The American version of the site, accessible previously, was excellent despite the inclusion of ads. US lawmakers have passed a bill to shield telephone companies who helped in the White House’s controversial warrantless wiretaps programme. The bill also grants the US government the power to continue with its warrantless surveillance scheme. Future presidents can learn a lot from all this — do exactly what the Bush Administration did! If the law holds you back, don’t first go to Congress and try to work something out. Secretly violate that law, and then when you get caught, staunchly demand that Congress change the law to your liking and then immunize any company that might have illegally cooperated with you. That’s the lesson. You spit in Congress’s face, and they’ll give you what you want.